Height 5 feet 7 inches. Weight 154 lbs. Chest measurement 35-38½ inches. Complexion fair. Eyes blue. Hair brown. Sight - both eyes 6/6. Hearing & colour vision both good. Limbs well formed. Full & perfect movement of all joints. Chest well formed. Heart & lungs normal. Illness - rheumatic pains some years ago; no doctor. Free from hernia, varicocele, varicose veins, haemorrhoids, inveterate or contagious skin disease. No vaccination mark. Good bodily & mental health. No slight defects. No fits. Fit. George Huntley Hay was the second child and eldest son of George Hay and his second wife, Helen née Marshall, of 2 Hurdley Street, Timaru. Known as Huntley, he was born on 16 August 1895 at Glenomaru in South Otago, and was most likely educated at the Glenomaru School, with which his father was involved. Huntley was probably in his teens when the family moved to Timaru. 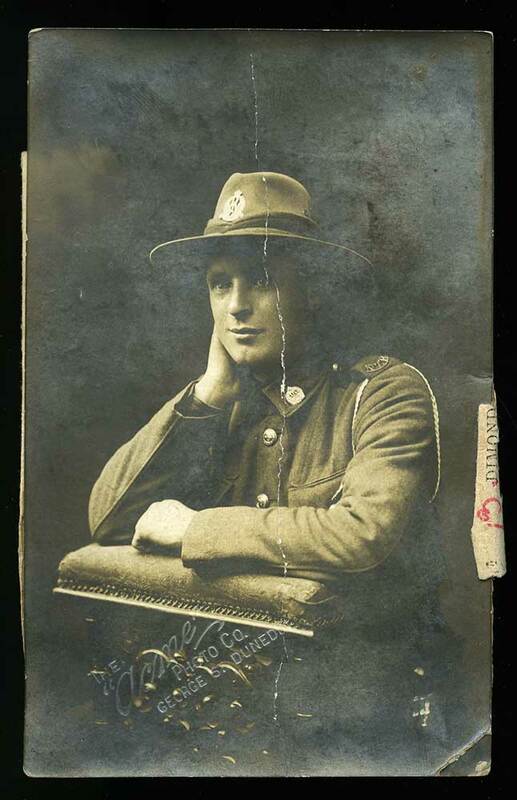 Huntley was a labourer for C. Gamble, East Taieri when he enlisted on 9 March 1916, single and having turned twenty just six months earlier. He nominated his father of Timaru as his next-of-kin. Standing at 5 feet 7 inches tall and weighing in at 154 pounds, George was in good physical condition, although he said that he had suffered from rheumatic pains some years previously. 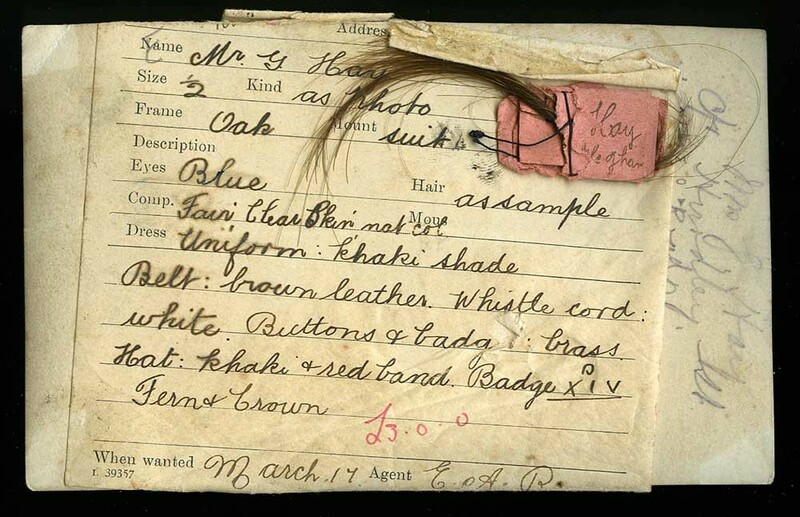 G. H. Hay, a labourer of Taieri, left Otago in early March with the men representing Group 15. He had no vaccination mark when he was medically examined but was vaccinated at Trentham a few months later. On 26 June 1916 he embarked at Wellington with the 14th Reinforcements, Otago Infantry Battalion, destined for Devonport, England. After a month at Sling he proceeded to France and joined his battalion in October at Rouen. He remained with the Otago Infantry throughout his time at the front. 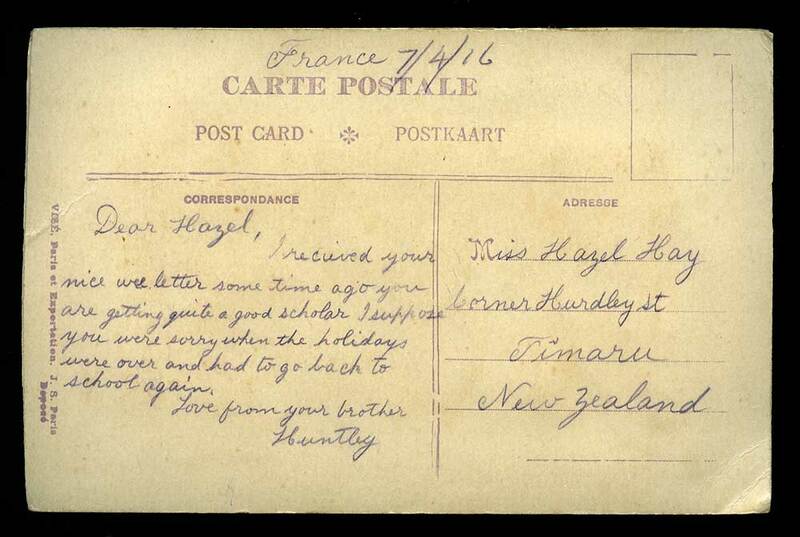 Private George Huntley Hay met his fate on 14 June 1917, killed in action at Messines, Belgium, just one year after leaving New Zealand’s shores and aged only 21 years and 10 months. His was one of 155 deaths recorded in Casualty List No. 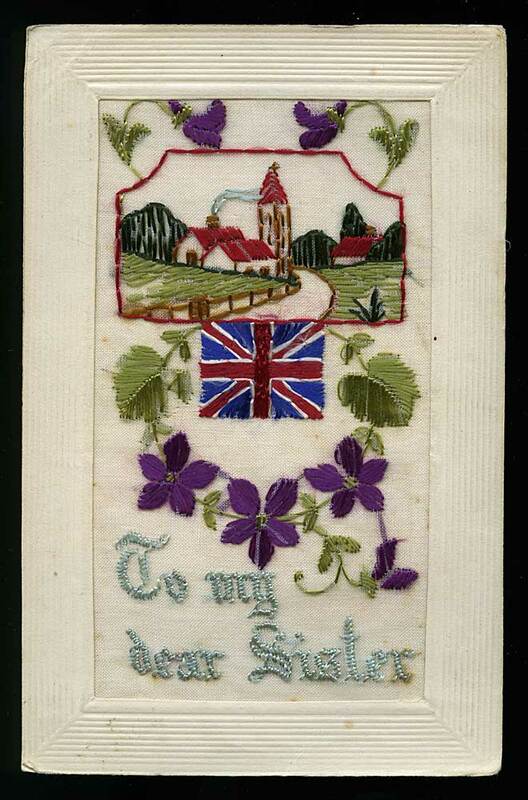 606 issued on 27 June 1917, the vast majority of the victims killed in action. A death notice appeared in the Timaru Herald of 30 June and in the Otago Witness of 4 July – beloved son of George and Helen Hay, Corner Hurdley and Otipua Streets, Timaru. Huntley Hay had been a member of the Oddfellows Lodge in the Clutha area. A lengthy list of men who had paid the supreme sacrifice was read out at a memorial service to them held in the Oddfellows Hall in late October 1917. The list which was compiled from the Clutha Leader included Pvte. G. H. Hay (Glenomaru). He was also a member of the Loyal Alexandra Lodge. Out of a membership of 94, 30 had gone to the Front, three of them making the supreme sacrifice as of July 1918. The Loyal Alexandra Lodge marked its fiftieth anniversary in April 1919, and at the banquet held at Port Molyneux, Brother G. H. Hay was again one of those honoured. Private G. H. Hay was survived by his parents, five brothers and two sisters, and one half-brother and one half-sister. His death was registered with the Mayor of Calais, as is the French custom, and in due course, notified to the Minister of Foreign Affairs. His medals (British War Medal and Victory Medal) were sent to his father.